There is fire on the mountain for #Kizz-Daniel and this is not a joking stuff. There seems to be no truce in the prolonged face-off between G-Worldwide Entertainment and its former artiste Kizz Daniel. Oluwatobiloba Daniel Anidugbe recently changed his stage name to Kizz Daniel from Kiss Daniel. Furthermore, the 24-year old singer also started his own record label named ‘FLY BOY INC’. But in a strange twist of fate, there is a new development. 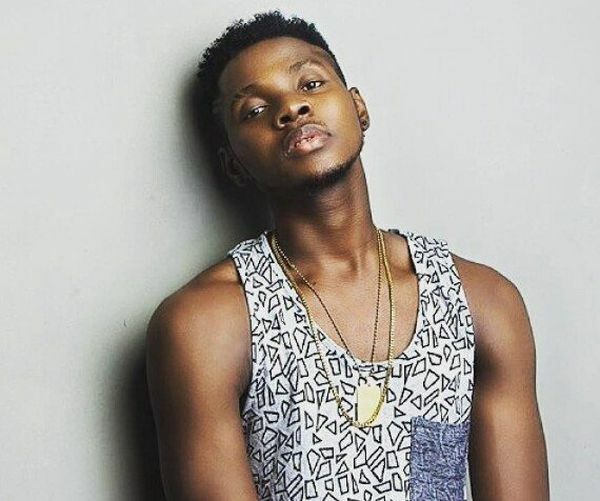 G-Worldwide Entertainment, Daniel’s former label, has informed the public that its case against Oluwatobiloba Daniel Anidugbe before the Federal High Court, Lagos Division, is still on, declaring that even ‘Kizz Daniel’, still belongs to the label regardless of the change in name. “Following several requests and enquiries by Nigerian and foreign online media and entertainment outfits about the status of the matter, it has become needful to notify the public of the current state of facts. 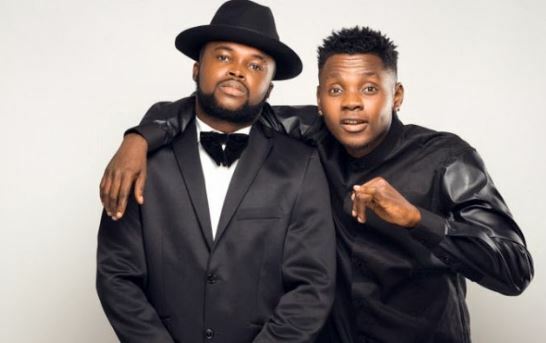 “The suit at the Federal High Court last came up on 16th May 2018 whereupon our lawyers informed the Judge of a pending application for status quo to further restrain the rebellious acts of the artiste in view of the recent release of previously unreleased songs from the Evolution album, as well as the continued use of the name Kiss Daniel without our approval. “The Judge emphatically told the Kiss’ lawyers to explore a settlement of the dispute as he does not believe the matter is one which should go to trial and that the lawyers should report on any settlement at the next adjourned date, 26th June 2018. We are unaware at the time of this release that the lawyers to Kiss have submitted any proposal with terms of settlement to our legal team. “It also interesting to inform the public that the Court was informed about the artiste’s release of the new song titled 4 Dayz, and For you a collaborated with WizKid , which are songs from the Evolution album, the ownership of which forms the subject matter of the suit at Federal High Court. We therefore need to let the public know that these releases demonstrate that the artiste is on a trip to put the credibility of other artistes whom he collaborates with in question. “We are also aware that the artiste has released the video of 4 Days, done a collaboration with Sheyi Shay titled Surrender, and another song Me ke with Omawunmi by changing his name from ‘’Kiss Daniel’’ to ‘‘Kizz Daniel’’. 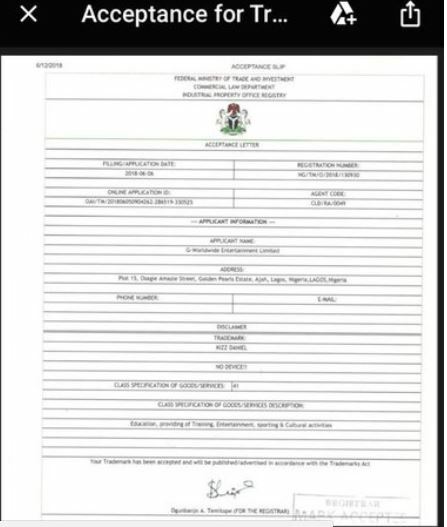 Let the whole world also take note that G-Worldwide is also the owner of the name ‘‘Kizz Daniel’’ (see acceptance and acknowledgement documents from the Ministry of Trade & Investment below). “All digital platforms have been put on notice for take down of infringing materials where the name Kizz Daniel is in use, and we have responded to foreign and local media outfits on this issue following calls for clarification. We also wish to formally inform the public that the artiste’s use of the names Kiss Daniel and Kizz Daniel amount to breach of the company’s intellectual property rights. Well, Daniel’s team apparently forgot a simple thing to trademark his new name in accordance to the Trade Mark Acts Nigerian law. Unbelievable! Only In Nigeria! This is Nigeria! Our fingers crossed for what will happen next in this matter.